Schools are among the most significant structures in a child’s ecological system. Children interact with systems around them such as their families, communities and schools. These interactions provide them with opportunities to enhance their knowledge, build skills and develop belief patterns and attitudes. Schools offer literacy and numeracy skills, but they are also a microcosm of society, reflecting the values, ideas, history and needs of the culture to which children belong. Schools therefore have a larger responsibility of creating a space to facilitate students’ social-emotional, physical, spiritual and psychological development. While there is significant discussion on classroom management and teaching-learning processes that enable students’ socio-emotional learning, there is not much dialogue at the whole school or board level. For instance, while the CBSE has developed life-skills education (LSE) curriculum, it is something that appears as a standalone component. There are no provisions to integrate this within the existing curriculum and school culture. While LSE is conducted, the school is simultaneously creating a high-risk environment for students without offering much support. The day-to-day school time-table and the year-round schedule do not offer much to students for their personal and interpersonal development beyond academics. The school calendars currently are designed around an existing exam schedule. Teachers often approach teaching with a focus on syllabus completion and test preparation (Hindustan Times, 2018). This takes away from the essence of the learning process. The classroom atmosphere is characterized by pressure to excel in exams and this can create unhealthy competition. Students are often left with little or no time for leisure or relaxation. Most students, on an average in India, seem to be engaged in academic related activities including school hours for more than 12 hours a day. They do not engage in physical activities or tasks that will enhance spiritual or psychological wellbeing. Parents, in fact, consider such activities as a hindrance to academic achievement and discourage children from the same. It is well-known that children, especially adolescents, require adequate time for play and leisure to enhance interpersonal and intrapersonal skills and grow into well-adjusted young individuals. Amidst all the academic focus, the importance given to non-teaching activities in the school is then contingent on the time left after accounting for academic teaching hours. This means that schools have very limited non-academic possibilities to offer. It isn’t rare for music, art, dance and physical education classes to be swapped by science, math and other “important subjects”. This also sends across subtle messages to the students about the school’s priorities and expectations. This can have a lasting impact on how students’ perceive and work towards their non-academic goals and how much they strive to strengthen their skills and talents. Even in schools where self-development sessions are time-tabled, or life-skills sessions as mandated by CBSE are conducted, these are usually aimed at equipping students with skills like stress and time management with a focus on exam performance. While these skills are essential, a student also requires age-appropriate life skills. In such an academic-driven calendar, where does holistic growth feature? According to the National Mental Health Survey of India, 9.3 million children between the ages of 13-17 are in need of mental health care and prevalence of mental health concerns among this age group is as high as seven percent (NIMHANS, 2016). These statistics are alarming and cause for immediate concern. It is often argued that students have a laidback attitude towards exams if schools do not focus on achievement. However, anything beyond moderation can be extremely detrimental. 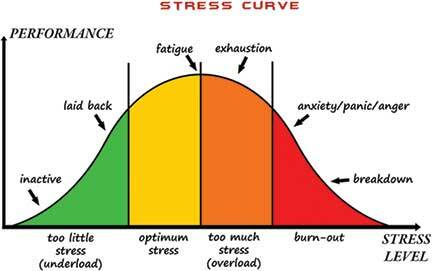 As seen in figure 1, optimum levels of stress may be essential for performance. However, a school calendar which is packed with academic tasks may result in student fatigue, exhaustion and in some cases severe psychological concerns such as anxiety and emotional and physiological breakdown. If we consider the case of exam anxiety in relation to Figure 1, one can say that exam anxiety may originate much before the exam schedule and the stressors in the school may all add up resulting in a final breakdown. The school calendar is therefore designed to create young individuals who can memorize, recall and strive to achieve under pressure, disregarding any individual differences, needs and challenges. An important aspect which schools and educational boards in India do not account for while planning their calendars, is the needs of special children. Children with physical disabilities, learning difficulties, developmental delays and disabilities all have a right to equal opportunities to learn and excel. Similarly, children coming from difficult socio-economic and family circumstances are also more vulnerable to emotional and psychological distress. The existing school calendar does not offer any safe spaces within the school for them to feel supported and cared for. Instead, the school may actually serve as a risk factor enhancing the levels of stress and discomfort. All of this coupled with the developmental changes, can be distressing for children who are looking for social support and nurturance. Children may often internalize beliefs about academic achievement and success which can hamper their long-term decisions and goals. Adapting to such a competitive environment is not easy. Every student’s threshold for pressure is different. It is not surprising then that some students can cope well in such environments and some struggle to do so. It doesn’t take much for optimum stress to turn into distress. 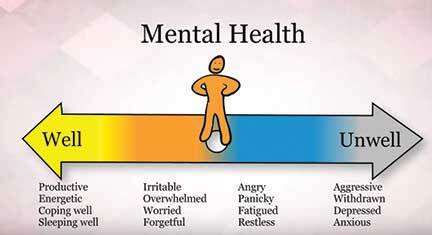 As seen in figure 2, mental health and wellbeing, just like physical wellness, lies along a spectrum. A child may be extremely healthy but the presence of continuous stressors and limited support may place him/her at a risk for mental health concerns. These may range from psycho-social distress, feelings of anger, irritability, low self-esteem to more severe concerns like anxiety, depression, self-harm, etc. Statistics from national level surveys in India show that student suicide rates are extremely high and that suicide is the leading cause of death among adolescents (The Lancet Commission, 2016). While the students are impacted in many ways, it is important to recognize the effect of such an academic calendar on other stakeholders like school teachers. Teachers are also likely to experience stress because of limited teaching hours, mandated non-teaching duties, parents’ demands, and the unrealistic expectations from schools and families of producing good students’ results. It is unfortunate that schools are unable to provide time to teachers for self-reflection. There is enough evidence in literature on business, work culture and work effectiveness which shows that down time for employees to recharge and rejuvenate can in fact result in increased productivity (Coleman & Coleman, 2012). However, a look at a school teacher’s year planner and daily log shows that there’s hardly any time to relax. Therefore, schools and educational boards need to reconsider the annual calendar keeping in mind the core objectives of education. To do this, all stakeholders including policy makers, school managements, principals, educators and families need to create a vision for schools which is child-centric and wellbeing-focused. Political discourses at this level are likely to involve much deliberation over a long duration of time. A whole-school approach that takes into account the needs of all children, including those with special needs, those experiencing psycho-social distress and those at risk for mental health concerns will be a significant step in this direction. A few action steps that school leaders and educators can initiate to address the impact of a rigorous school calendar are listed below. These require collaborative efforts from all stakeholders within the school and continuous monitoring to ensure effectiveness. 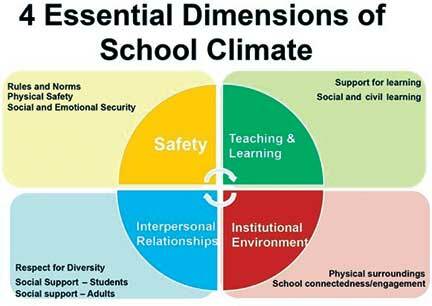 Creating a safe school climate – Encouraging positive relationships among students, between teachers and students and teachers and school leaders can foster a sense of cohesiveness and safety. As seen in Figure 3, a safe school climate creates respectful spaces for students and teachers to express distress, reach out and seek help and support whenever required. A conducive school climate will not only help students but also encourage teachers to be motivated and effective (Adu, Olatundun, & Adu, 2016). Including socio-emotional learning within curriculum – Apart from life-skills education, students require common classroom spaces where they are engaged in building awareness about their own social and emotional experiences and learning to cope with the existing stressors through individual resources and peer support. Reflection time for teachers – Re-scheduling time-tables and ensuring that each teacher may have free periods may not be a viable option for schools where human resources are limited. However, a slot for teacher reflection which allows teachers to recharge by offering options like relaxation, group energizers, introspective activities, etc., may be a great inclusion within the weekly time-table. Empowering all voices – Schools are community spaces. If we expect students to become social leaders of change then we must encourage them to voice their opinions within the school. Circle times, school union meetings, group discussions, etc., allow students to engage in problem solving and to express themselves without the fear of being judged while also respecting disagreements. It is time that we recognize our roles and work towards restructuring our systems in small ways to create positive and safe environments for children. (2016). National Mental Health Survey of India 2015-16: Prevalence, Pattern and Outcomes. Bengaluru: National Institute of Mental Health and Neuro Sciences. (2016). The Lancet Commission on Adolescent Health and Well-being. The author is a practicing mental health professional trained in clinical psychology with a keen interest in adolescent wellbeing, school mental health and practices informed research. She can be reached at lamia.bagasrawala@gmail.com. An event or a process?